Hi, everyone! Happy Monday. I’m back to share a bright and cheery card for Penguin Palace! It’s weird to think that the holidays are over and it’s time to move on to the next seasonal project. But that’s just what I’m doing today by sharing a Valentine’s Day card with you! I started the card today with a background die that created polka dots from a piece of white card stock. I ink blended yellow ink from Catherine Pooler onto the die cut panel and adhered it to a piece of black card stock. I also die cut a scalloped circle from the lower right side to highlight my scene. Then I got inky! 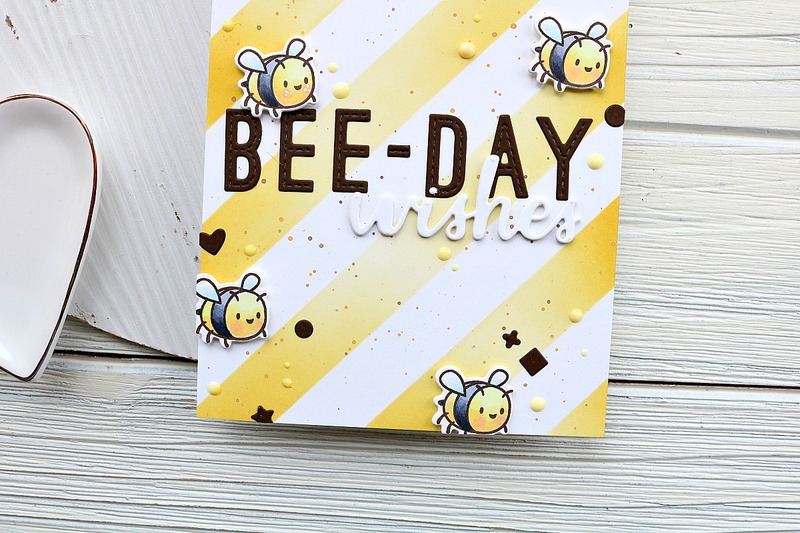 I stamped out a handful of the images from the Bee Happy stamp set. These cute little bees and the scene building images are so fun. 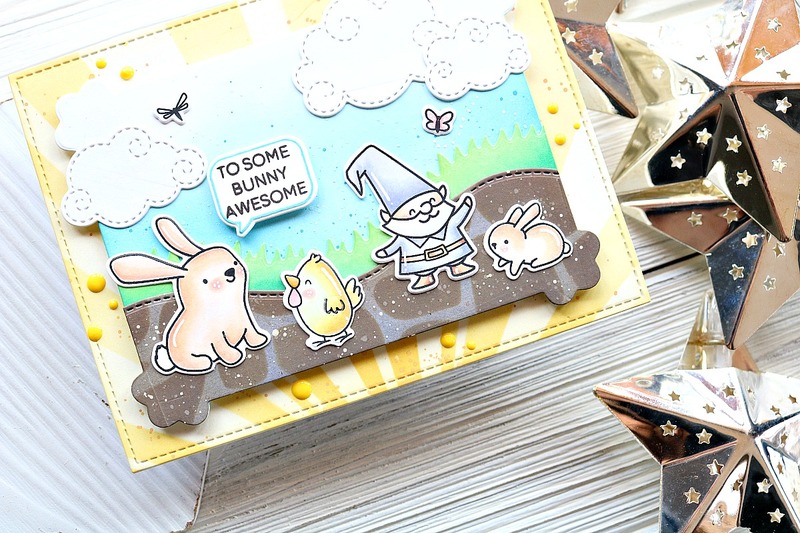 I love all the possibilities this stamp set provides! Once I had colored everything with my Copic markers, I die cut them out with the coordinating dies. I also stamped out some of the trails with red ink to make it more in the Valentine’s color realm. The images were arranged to make a little scene of these two cuties exchanging Valentine’s Day presents. I wanted the sentiments to match the ink color of the trails, so I took the same red in and swiped it across some heavy weight white card stock until it was completely covered. To finish the sentiments I heat embossed two of the sentiments from the set on the red inked paper and then trimmed them down. They were adhered with foam tape. To finish the card I added some pink and white Nuvo Drops and tucked some gold string beneath the beehive and under the scalloped circle. That finishes my card! I hope you liked it. Do you think it’s too early for Valentine’s cards?? I have to admit, it’s never too early for me. I’m always behind, so getting a head start always helps 🙂 Thank you so much for stopping by! Have a great rest of your day, and I’ll see you again soon! 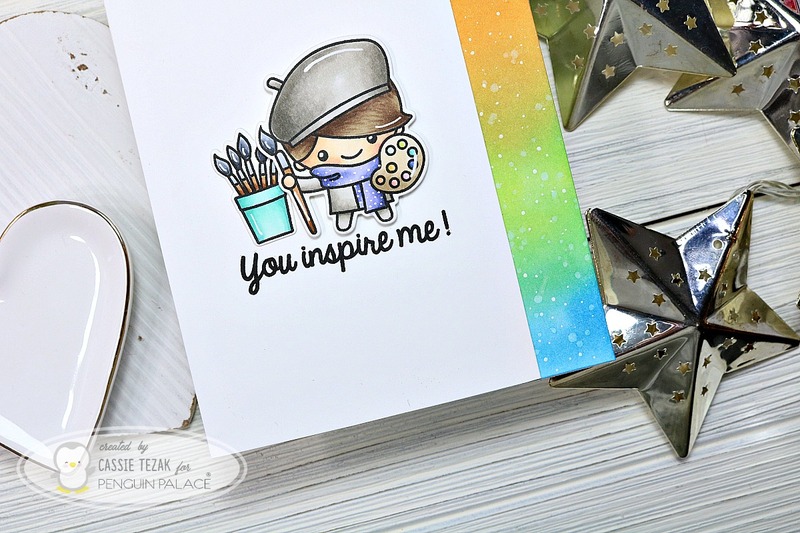 Previous Your Next Stamp January Blog Hop!